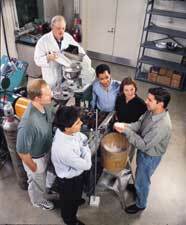 The MMM program lets Kellogg students go on-site to assess facilities, as here in the Evanston Research Park. More than a decade ago, Kellogg partnered with the Robert R. McCormick School of Engineering and Applied Science to establish the world's premier manufacturing management program at Northwestern University. By combining both management and engineering into a single program, the Master of Management andManufacturing (MMM) has created a curriculum that its faculty and students have called challenging, diverse and dynamic. The goal from the start has involved teaching students to develop a command of business strategy, while fostering a deep appreciation of technical fundamentals. It's the powerful versatility of these blended skills that has made MMM graduates leaders within product-driven companies, such as Intel, Dell Computer and Cisco Systems. Kellogg's dean, Donald Jacobs, recalled the impetus to develop MMM. "There was a large critical voice in the United States at that time complaining about the country's declining capability in manufacturing," he said. "The implied statement behind that critique was that business schools were not doing as much as they should to help solve the problem." So Jacobs huddled with McCormick's then-dean Jerry Cohen to lay the groundwork for a program that would pool the school's respective strengths. "We knew we could do something dramatic, even unique, if we brought together our overlapping but distinct faculties," said Jacobs. "So we did just that." Doing "just that," however, required hard work and the concerted efforts of each school. According to Kellogg professor Sunil Chopra, director of MMM, "the main challenge involved getting two schools with diverse environments to come together in designing a joint program where the students enjoy a truly integrated experience -- and benefit from the strengths of both schools." Jacobs agreed that developing a joint curriculum "is never the easiest thing in the world," but he credited the faculties of both schools with having the vision to build MMM. "Right from the beginning there was a large amount of cooperation," noted Jacobs. "Everyone involved appreciated the value that each party brought to the table." Since its inception, MMM has graduated nearly 500 students who have developed their skills through aspects of the program such as the "Integration Project." This important practical course affords students the hands-on opportunity to assess the economic viability of a company's new technology by working closely, in teams, outside the classroom with real manufacturers. Students also have the option to develop a business plan for an entrepreneurial venture as part of the Integration Project. According to Chopra, MMM is continuously evolving in terms of the courses offered. "The program has absorbed the Kellogg culture that rewards continuous improvement and experimentation -- and the students are actively involved in improving the program," he said. This year, Chopra pointed out, MMM has put a revised curriculum in place that offers more flexibility of course offerings, and more courses designed to prepare students to meet the demands of the technology sector. In addition, feedback from alumni and students resulted in the program extending a dual degree to graduates, who now receive an MBA from Kellogg and the MEM degree from McCormick. Looking back, Chopra admitted that everyone involved in developing MMM placed high expectations on the fledgling major. "While we were optimistic when we started," he said, "the reception our students have received in the job market has exceeded our expectations."